Often found staring into trees in search of a tui. Mystic wordnerd. Independent friend. Urbanite hermit. Head in clouds. Literary. Beachwalker. Multilingual. Grace Bridges is a sci-fi author (Faith Awakened, 2007; Legendary Space Pilgrims, 2010) and owner of Splashdown Books, an independent publisher of inspirational sci-fi and fantasy. 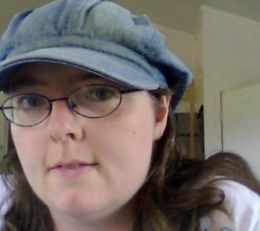 She’s a Kiwi of Irish descent living in beautiful New Zealand, and a chocaholic cat-lovin’ Trekkie, Jesus freak, web designer, and all-round DIY gal. Find her on Facebook and Twitter. Speculative fiction is my life’s blood, the air that I breathe. There’s one main reason for this. It blows my mind. And that is something I enjoy very much. When I experience a story that blows my mind, I can feel the horizons of my thoughts expand beyond where they were before. It makes me see the world in a new perspective and causes progress in my personal development. That’s not all, though. I’m certain that whenever my thinking is stretched, each time my view is encouraged to morph again, it shows me another facet of just how amazing God is. This is what connects speculative fiction to worship. Colonies thousands of years in the future and hundreds of light-years from Earth? (1) Mind-blowing. A race through virtual realities, with hero and artificial villain engaged in philosophising the meaning of forgiveness? (2) Mind-blowing. King Arthur appearing in modern London to lead Britain to her destiny? (3) Mind-blowing. Yes! Take me there! Wow me! Make me tell God he’s incredible for putting that amazing idea in someone’s head. And there is no end to new greatness—God goes on forever. It became an obvious decision to step into publishing. To help bring some of these excellent stories into the public eye, where they would otherwise languish in obscurity. I may be only one person, and I may live at the end of the world, but there’s a small part I can play in connecting authors with readers. And so I picked up the story of the writer with writer’s block who, in pursuit of inspiration, gets sucked into a fantasy world (4). After that came an otherworldly fantasy with high drama and romance (5), a deeply psychological spacefaring tale (6), the superhero inflicted with hilarious clumsiness (7), and the boy with the miracle ring (8). There is plenty more ahead, of course, and I’m excited at what the future holds: not just novels, but other kinds of projects too. Come June we’ll have eleven titles out there. When I began Splashdown Books I considered the submissions process very carefully, and how it should work. I’d been on the other end of it often enough as an author, and wanted it to be as friendly as possible – and not just add to the cycle of rejection that is so common in this industry. So I ended up continuing what I had done as an individual – to critique material sent to me, so that the author has a benefit from our interaction. I start with the first few chapters, and if I like those, I’ll ask for the rest – and in any case, I will put on my editing hat and give the work a thorough going-over. In this way it is my hope to encourage authors even if their book is not right for Splashdown. It’s been almost two years since Splashdown started with just me and one author. Now there is a wonderful team: ten authors and more in the pipeline, plus several artists, designers, editors, marketing people, and even musicians who provide the soundtracks to our videos. I’m always on the hunt for more staff, so let’s talk if you think you might like to get involved. So that’s Splashdown in a nutshell. I have a question for readers here—what kind of genre would you like to see more of in the area of Christian speculative fiction? Obscure is outstanding! Mashups are marvellous! What do YOU want from Splashdown? My own favorite genre is cyberpunk, but I don’t think genre matters as much as quality. As long as you’re putting out the best of the best, all else follows. Keep doing what you’re doing, Grace! I love to fall into another world. I want to care about who I’m reading. If a writer can do that, it doesn’t matter what genre. You go Grace. How wonderful when we see our dreams birthed and nurtured and God is in the mist of it all. I love cyberpunk too – that’s mostly what I end up writing. Mainly I like space opera and fantasy, which, surprise, is mostly what I write. But I certainly like reading other things as well. Spoofs, humor, really anything that is entertaining and interesting, and best if it doesn’t attack my faith in the process. Though, admittedly, I usually stay away from horror. Just not my cup of tea. Superhero fiction…I think this is an untapped genre in Christian speculative fiction. I would like to see more of these stories. Sure we do. We have Bible Man! My lame joke aside, I think largely it’d be difficult to come up with something completely “new” at this point, given the number already out there. Not saying it isn’t possible, but I think in some respect the Incredibles movie does a great job honing in on the structure of a superhero type.